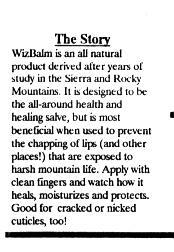 WizBalm is an all natural product derived after years of study in the Sierra and Rocky Mountains. It is designed to be the all-around health and healing salve, but is most beneficial when used to prevent the chapping of lips (and other places!) that are exposed to harsh mountain life. Apply with clean fingers and watch how it heals, moisturizes and protects. Good for cracked or nicked cuticles, too! In fact, there are quite a few places that WizBalm is better at protecting and healing than any product available on the market today. WizBalm is soon to develop a colored lip gloss............stay tuned for information! WizBalm is made in Boulder, Colorado and has been for over 20 years. The basic recipe is still a secret, much as is Coca-cola. As with Coke, too, there are many imitators, but only one original! E-mail WizBalm for information and order forms. First Time Orders will need to contact our credit office. Please include your phone and E-mail address as well as a postal address. 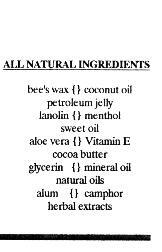 Petroleum jelly (PJ), or Petrolateum, has often been maligned as a man-made or un-natural product. PJ was discovered by roughnecks and roustabouts on the oil rigs....They found that this very light, whipped component of oil would soften and moisturize their hands as they worked with the shaft. PJ is not a refined hydrocarbon....it is merely a lighht weight fraction of the natural oil produced by the decay of pre-historic plants and animals.